Yes, this is embarrassing. I am publicly announcing that I care enough about our roto team to think about whether or not it was wrong to cut Juan Pierre and George Sherrill last night. As we've mentioned before, our league this season has been operating without free agents, but rather everyone in the free agent pool is on waivers every night. We placed a slew of waiver claims last night, and three of them were executed while we slept. First, the one that got away. Our team has Joakim Soria as one of our closer. We decided to cut George Sherrill because, although he gets occasional saves for the Orioles, his WHIP and ERA may not be good enough to justify the appearances when save opps are going to guys like Chris Ray or Jim Johnson. Our first waiver claim was Sherrill for Juan Cruz, who is stepping in to close while Soria is on the DL. However, we did not get Cruz. Another team in our league, "Blow Me Where the Pampers Is" beat us to the Cruz pickup, by dropping KC teammate Alberto Callaspo. We still sent Sherrill packing, for another Royal, Luke Hochevar. 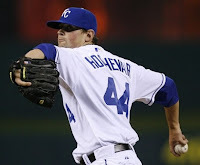 At least there's a bit of symmetry, as Hochevar joined the Royals to fill in the place of Soria as he goes on the DL. I'm excited with our Hochavar "lottery ticket" because the former #1 overall pick could become a top of the rotation guy immediately. 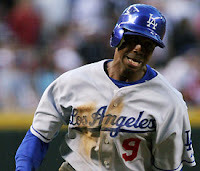 He struggled in the majors the last couple of tries, but he still has undeniable tools and youth on his side. We also remorselessly dropped David Aardsma to pick up Daniel Bard. 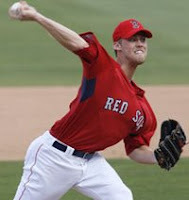 Daniel is a Red Sox reliever who is not in line for Saves any time soon, but he does qualify at the SP position and I hope he will improve our standing in W's, K's, WHIP, and ERA. 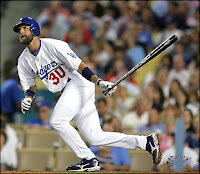 The third waiver transaction we executed last night is the questionable pick up of Casey Blake for Juan Pierre. I believe that in a vacuum Pierre is much more valuable than Blake. However, the same day that we posted a column celebrating our patience with Chris B. Young, we impulsively dropped two "valuable" players in Sherrill and Pierre because their "value" is not what our team really needs. When the ManRamRoid news hit the street, I initially thought Pierre was a must-add in all formats. That is probably correct. I considered the fact that my team has more than enough speed and we need HR's and RBI's badly. We already have enough speed with Reyes, Ellsbury, & Figgins in our everyday lineup, with other guys who run a bit like Rickie Weeks, Matt Kemp, Alexei Ramirez, and hopefully Chris B Young contributing. So, we almost didn't add Juan Pierre, but then we thought that he is better off on our team - even on the bench - than if he's helping someone else. After Pierre's hot start during the first few games of Manny's suspension, we reconsidered again and decided that we need the positional eligibility and occasional HR and RBI production out of Casey Blake more than the SB's and R's from Juan Pierre. Have I made a mistake? Probably. Will our team suffer from losing Sherrill? Probably, but I hope not. I sincerely hope that the saves he gets the rest of the year do not outweigh the damage he does to ERA's and WHIP's, when compared to the opportunity cost of having a lights out reliever who gets occasional Wins instead of occasional Saves. Will our team suffer from losing Pierre? I actually don't think so. I think the only real risk can be known when we see who winds up with him. Hopefully, he will be on a team that does not contend and he can even help by knocking a contending team down a few slots in SB.